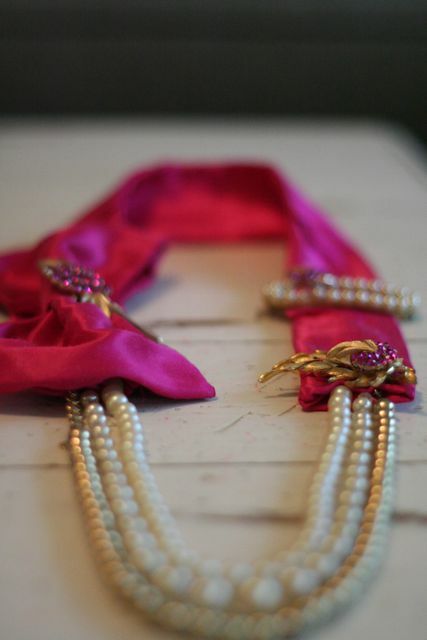 DIY: Give those Old Beads some Oomph! 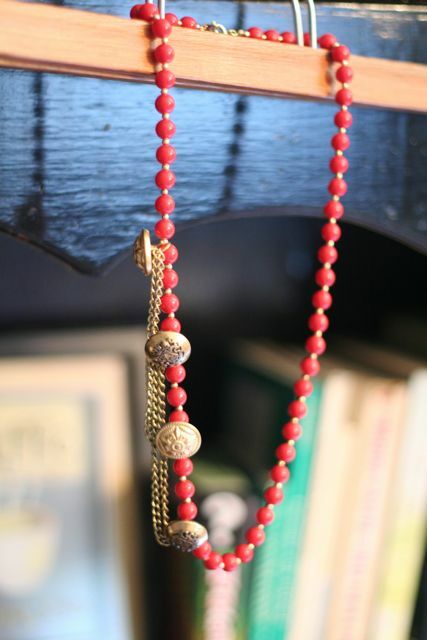 I found this strand of red beads at the Goodwill and after finding the coat buttons with chains at the estate sale last weekend I decided to see what they would look like together. I really like how it turned out, kind of reminds me of something that would be on a marching band or military jacket. 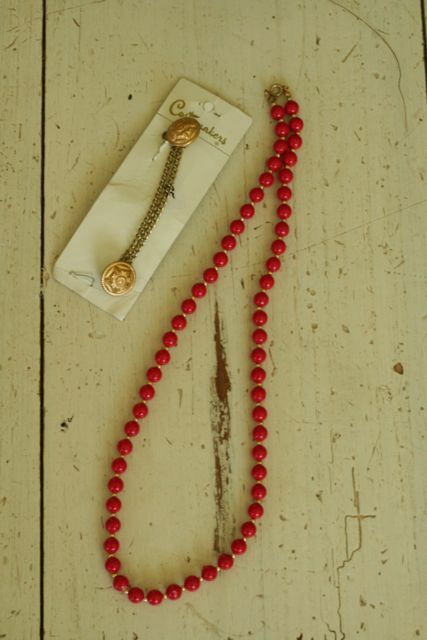 This was super easy, I just used my jewelry pliers and opened up the link and clasped it between two big red beads and then attached another link to the button and chain at desired length apart and clasped it between two more red beads. 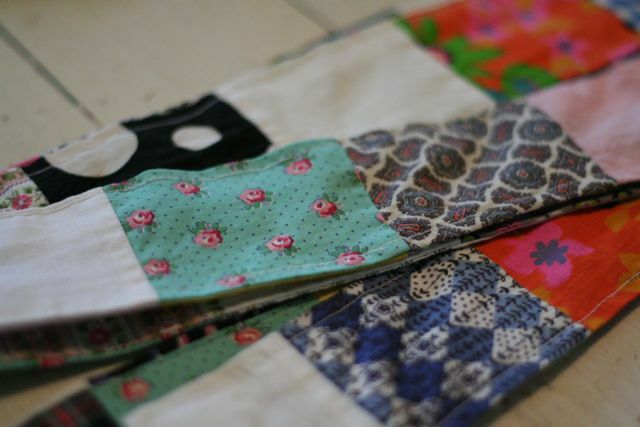 For the second one, clasp the button between the first two buttons and then at about the same distance apart as the first set clasp the second button. I love it! All this for around .50 cents. 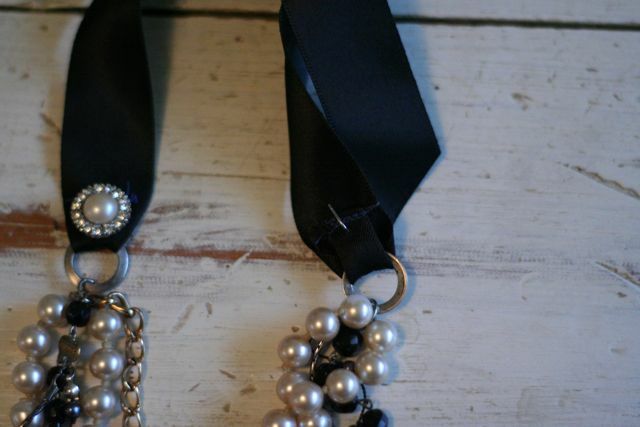 This entry was posted in DIY, I made this!, Recycled, tutorial, upcycle, vintage on July 14, 2010 by Deanna. This past weekend I visited an estate sale near our house. It was a huge barn filled with vintage goodies. I had my eye on a lot of different things but had to scale down a bit. 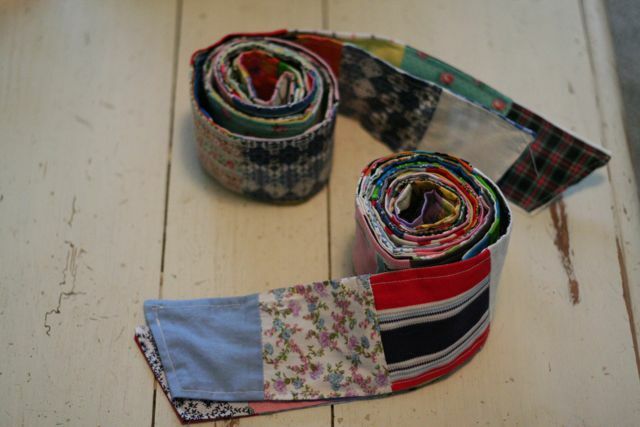 This lady must have been a sewer because she had a plethora of vintage fabric. But I did not leave with any fabric because I already have too much and until I work my way through what I have, I wont be buying anymore. 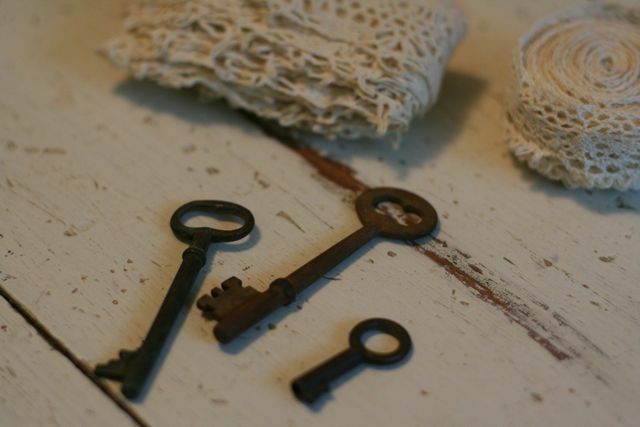 I found vintage croceheted lace and these 3 keys. 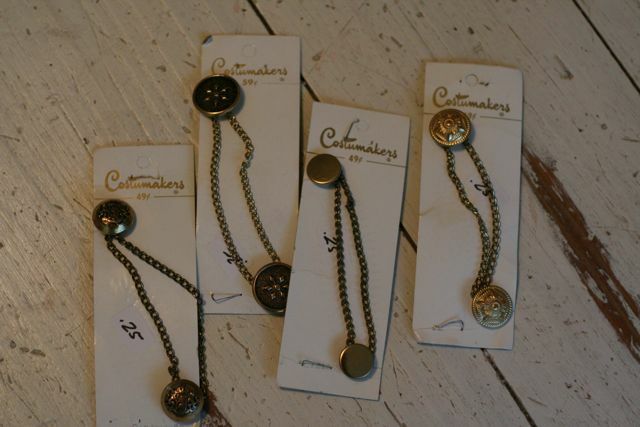 I also found these great coat buttons, which I’m so excited to use on some necklaces. I also found rice paper hankies, which I had never heard of before, and I found a nice wooden croquet set that looks like it was from the 70’s. I hope you can get out to some estate or garage sales this summer, you are guaranteed to find some amazing deals and items. 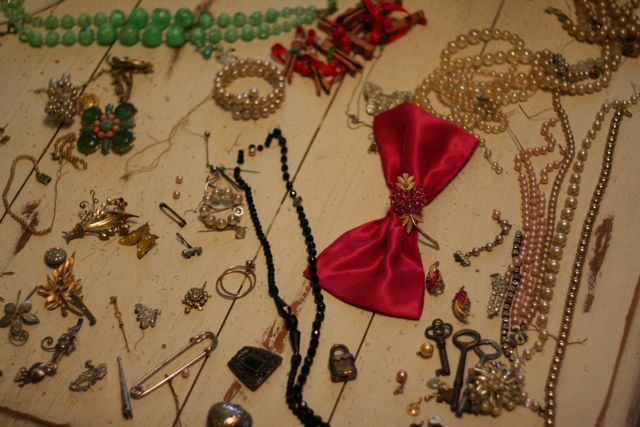 This entry was posted in garage sale, vintage on July 13, 2010 by Deanna. 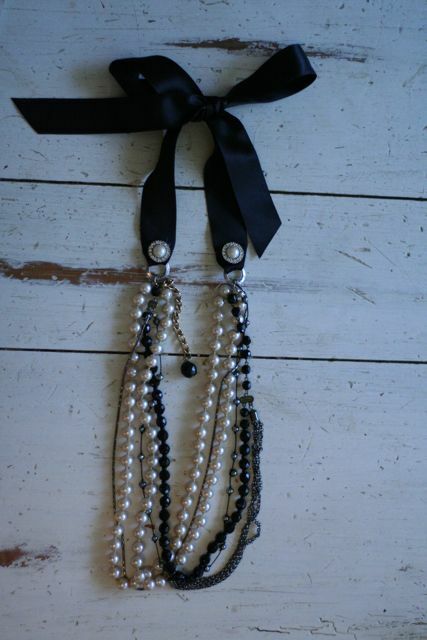 I finished another recycled necklace. If you have ever worked with jewelry you know that you have to have the right tools to take apart or add to jewelry, believe me I tried with regular pliers and it did not work. So I bought a five piece set of small jewelry pliers that have been so nice to work with and made this process of jewelry making so much easier. Here is my latest necklace. 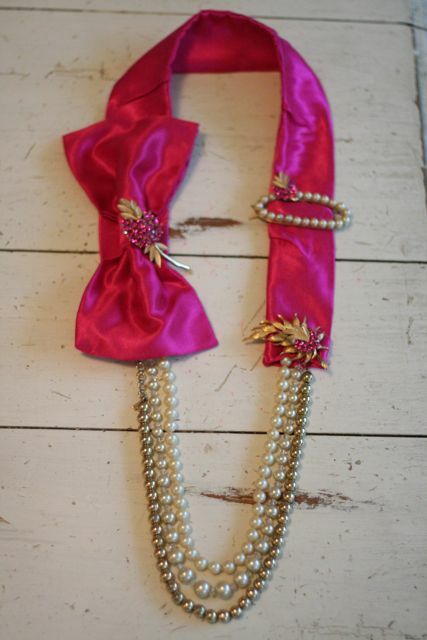 This one I used a satin bow from a ballet dress I found at the goodwill, and all the necklaces were re-purposed and put together from old jewelry I bought in a lot from the thrift store. The little jewels I used at the top are actually earrings that I poked through and bent the posts to cover where I sewed the satin ribbon on. I love how it turned out and I wore this last night and it was totally comfortable. 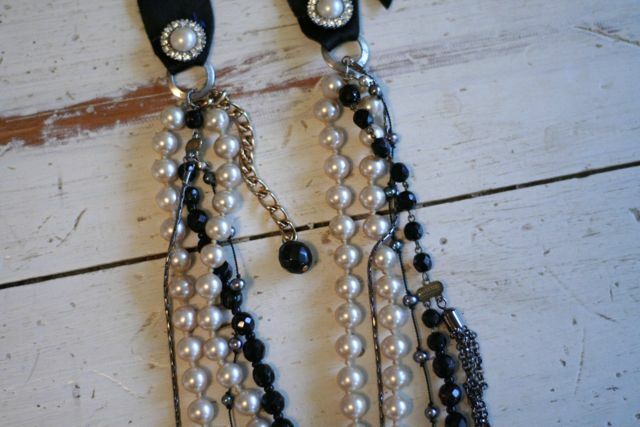 This entry was posted in Check this out!, DIY, I made this!, Recycled, upcycle, vintage on June 24, 2010 by Deanna. I have been so busy and I have a ton or projects that are half done and nothing I can share with you yet. With my daughters prom one week, then graduating from high school the next week and the last day of school for the year for my youngest tomorrow, I just haven’t had time to finish anything. 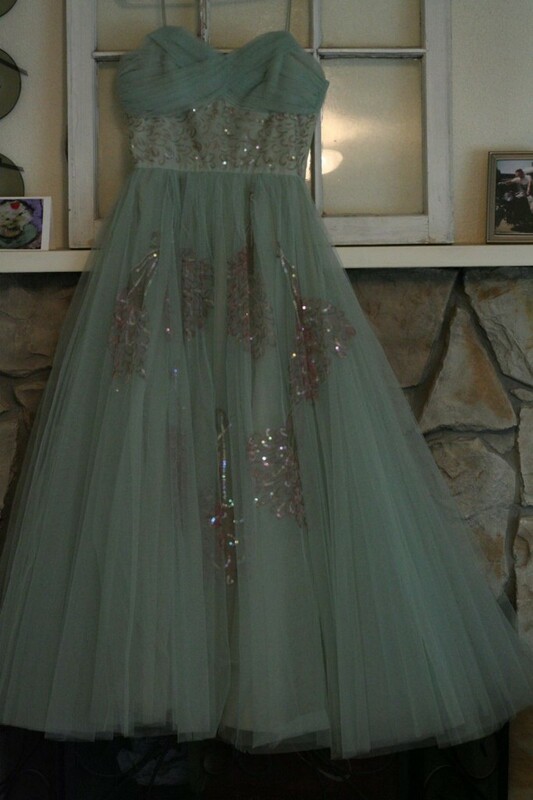 To hold you over I wanted to share this with you – My daughter in her vintage prom dress. Doesn’t it look beautiful on her. 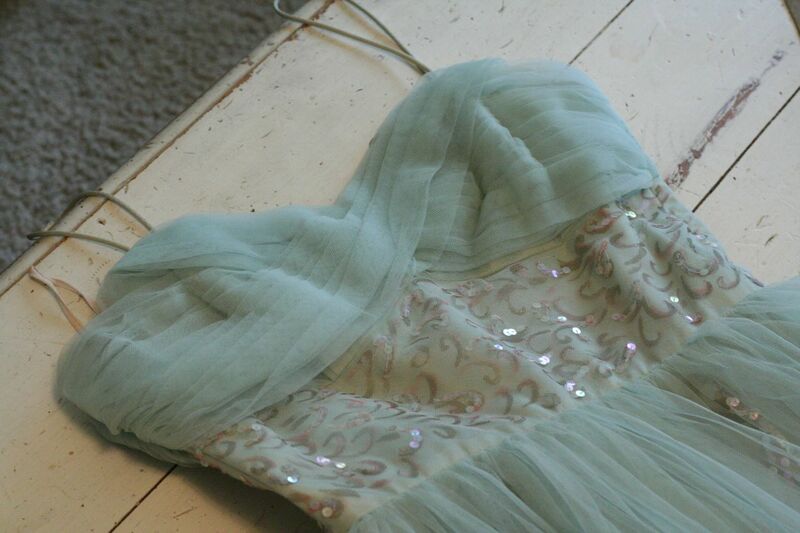 My pictures in the last post just did not do the dress justice. 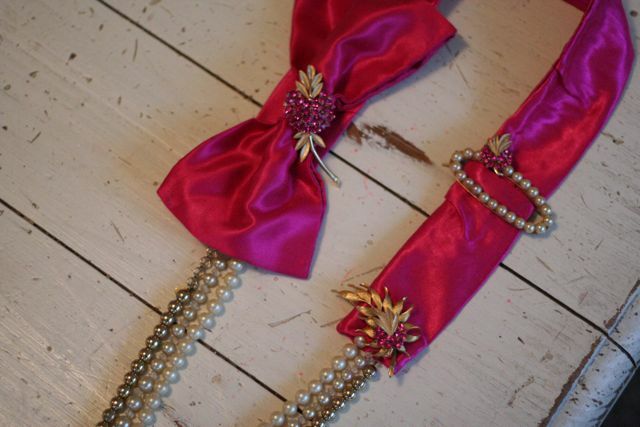 This entry was posted in vintage on June 15, 2010 by Deanna. 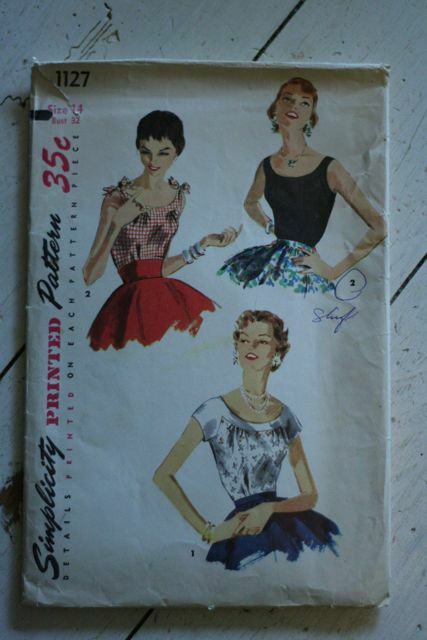 I came across a huge box full of patterns at the thrift store the other day and found these beautiful patterns. I am not sure the age but I would think 50’s and 60’s. They are in a larger size but with a little adjustment I would be able to make them work for me. 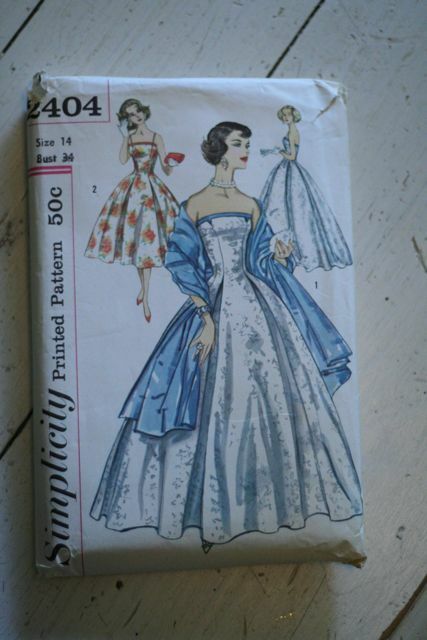 This entry was posted in Patterns, Thrift Finds, vintage on June 2, 2010 by Deanna. My mom has been cleaning out her house. Its taken a while for her to do this because so much of what she finds reminds her of my dad. He passed away 1 1/2 yrs ago and I’m so proud of her for making these strides in dealing with the loss. She amazes me. 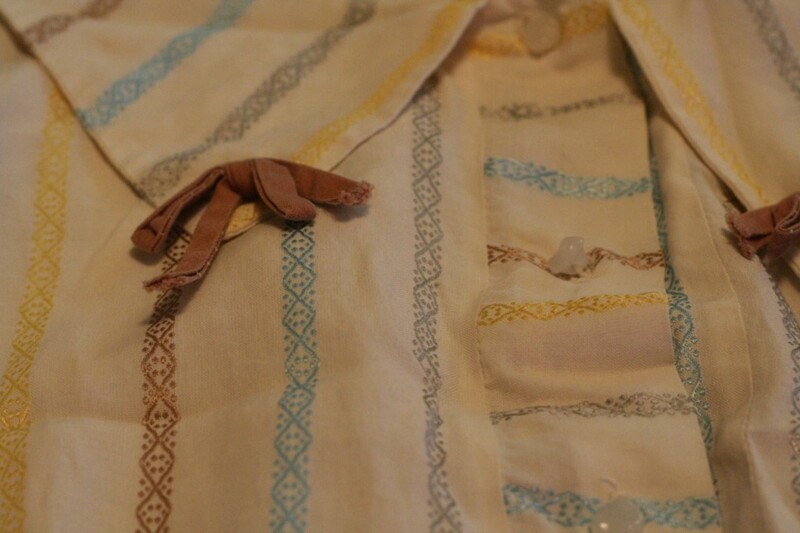 The other day she came across some old clothes of hers and this shirt was among them. She says she thought of me when she found it. I am so glad she didn’t just throw it out. I am so excited to wear this, its so cute. My daughter loves it too, first thing my daughter said to me was “You aren’t going to cut this apart, are you?”. I assured here I wouldn’t. 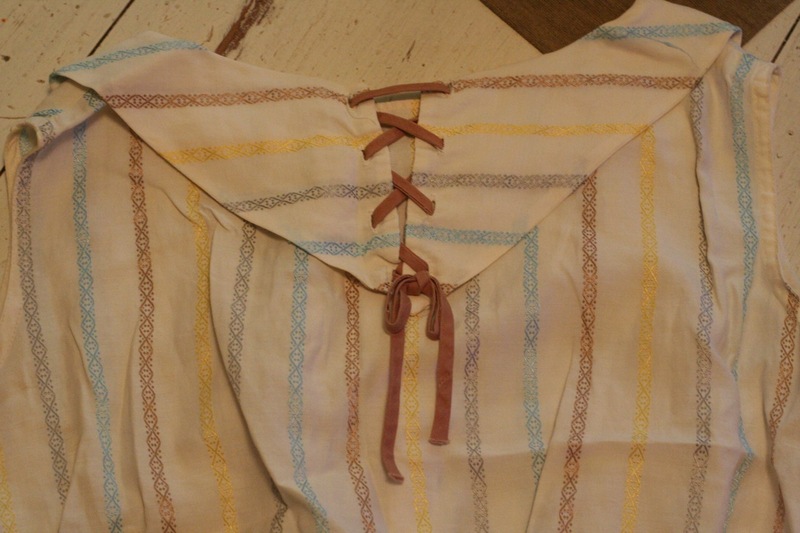 The Back, I love how this laces up, it reminds me of a sailor top. The colored stripes have a shine to them, I love it. 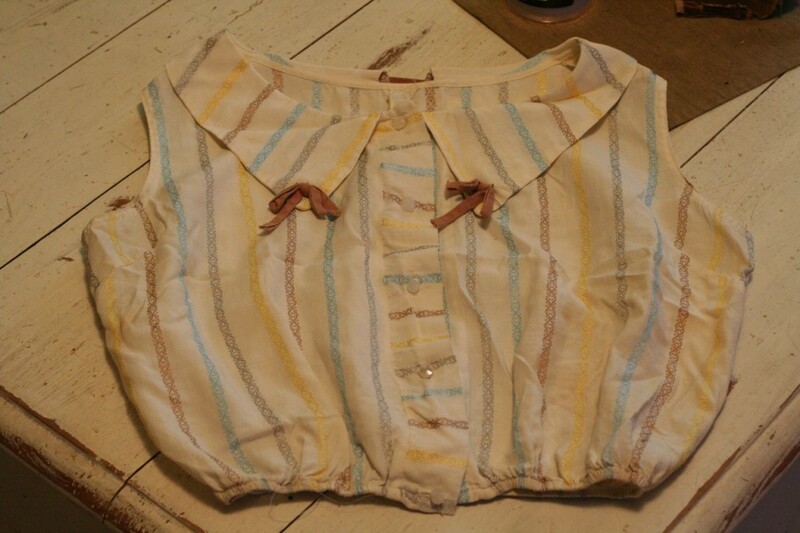 Can’t wait to put on a cute pair of jean shorts with this top. This entry was posted in vintage on May 18, 2010 by Deanna. 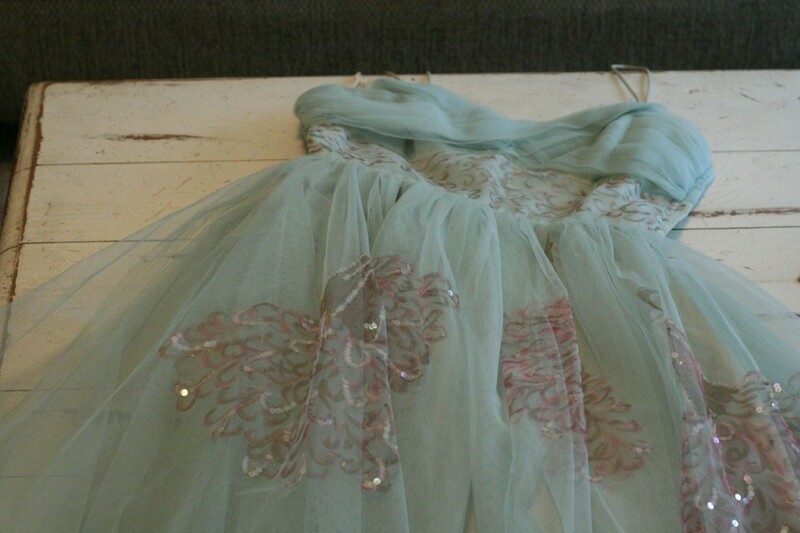 We have gone back and forth on the whole dress ordeal for my daughter and I just felt I didn’t have the knowledge or time to put into a dress like she wanted. So a few weeks back we found a used one and we were excited about it, but it needed some work, even though my daughter liked it, it wasn’t what she really wanted. We had looked for a vintage dress and never found one that suited her, until this past weekend. We were at the coast for a few days and a friend had told me about this cute vintage shop down there. When we finally found the shop and made our way into the store the first thing to catch our eye was this mint green vintage 50’s dress. It was so cute. I expected it to be a few hundred dollars but to our surprise it was only $50. We looked around the shop a bit and we kept being drawn back to the dress, so my daughter finally said, “Im going to try it on”. And it fit perfectly! She walked out of the store with her new prom dress! 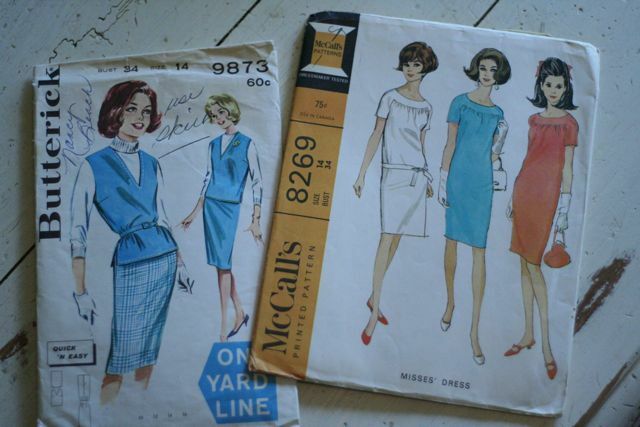 This entry was posted in Check this out!, Thrift Finds, vintage on May 10, 2010 by Deanna.